Kuching is the capital city of Sarawak, Malaysia's largest state situated on the island of Borneo. In Kuching city, you will be astonished by the beauty of the green environment. The people here are kind and friendly and will assist tourist who needs help. The tourist attractions are located nearby and there's no need to take a taxi or bus to enjoy the wonders of Kuching. In the city, there is a river separating the north and the south called the "Sarawak River". Riding a sampan along the Sarawak River is an unforgettable experience. From the river, you can get a spectacular view of the Malay Kampungs (Villages) with a gorgeous mountainous background. You also get to see a far distant view of the 19th century Chinese shop houses, the Malay mosque, the square tower and the attractive Margherita Fort. In Kuching, there are old Chinese temples, Brooke era buildings with unique architecture, waterfront park, observation towers and museums. There is a wide range of accomodations ranging from budget hotels to luxury 5 star hotels. After a long day, you can feast yourself with local delicacies such as seafood, chicken rice, Malay Nasi Lemak and chinese noodles. Kuching's name is originated from many sources. In the Malay language, Kuching means cat. Some sources say that Kuching originated from the Chinese word "Gu Chin" which means harbour. Another sources say that Kuching is named after a lychee like fruit called Mata Kuching (Cat's eye). 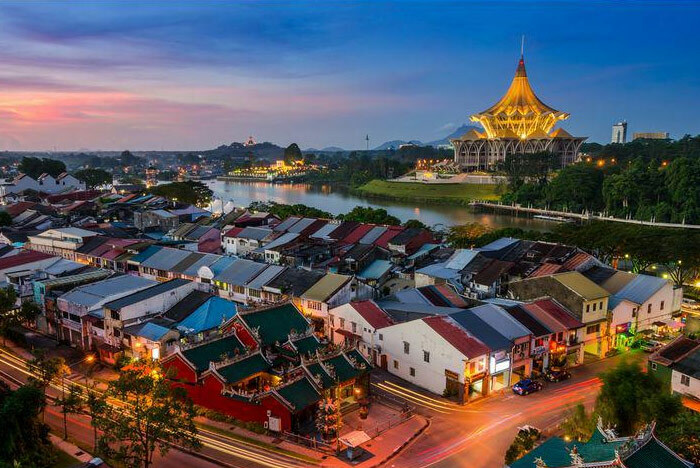 Kuching, the state capital of Sarawak, is one of the most interesting cities in Southest Asia, and one of Malaysia's most rewarding travel destinations. It has everything the discerning traveler could wish for. Kuching's romantic and unlikely history features a hundred-year dynasty of White Rajahs. Its rich and varried architectural heritage mixes many styles and influences, whilst the relaxed hospitality of its charming citizens is an object lesson in multi-culturalism. It is also the perfect base for discovering Sarawak's interior. The Sarawak State Museum is the oldest museum in Borneo. It was established in 1888, and opened in 1891 with a purpose-built building in Kuching, Sarawak. It is now called 'Ethnology Museum', which houses various ethnic displays and historical items of Sarawak. The Kuching Waterfront is the best place to view the Astana, Fort Margherita, adjacent Malay kampungs of Kampung Sinjan, Kampung Lintang and the newly constructed DUN complex. A chance to experience life with the indigenous Iban tribe deep in the interior of Sarawak! See how their lifestyle has remained simple and relatively untouched by the frantic pace of human development. The garden was developed to mark the symbol of friendship between China and Malaysia. It is beautifully crafted with small ponds and gardens, and is a perfect place for a stroll, feeding the Koi fishes, and trying your luck at the two wishing wells. The Astana meaning palace, is situated on the north bank of the river, just across the river from Kuching Waterfront. It was built in 1870 by Charles Brooke as a bridal gift to his wife, Margaret. Also known as Pasar Minggu, it is located at Satok and is a great place to observe local traditional trading. The Sunday Market comes alive beginning Saturday afternoon till the afternoon of the next day. This is a 3-building complex, landmarked by its tower with an umbrella-shaped roof. It is the best place to get a 360° aerial view of Kuching City. Take a beautiful snapshot of Kuching’s buildings surrounded by lush green trees. Operates as orang utan orphanage and rehabilitation programme. The rehabilitation centre is a place where you can enjoy sightseeing of wild plants and animals. This living museum shows the heritage of the major racial groups in Sarawak. It is also the site of the annual Rainforest World Music Festival. It's a very long row of shophouses for you to shop for Sarawak souvenirs and handicrafts. The boat tambang or “water taxi” on the Sarawak River beside the Kuching Waterfront is an endearing icon of Kuching for as long as anyone can remember. Taking a ‘sampan’ cruise is one of the must-do things for tourists visiting Kuching city. Fort Margherita is situated at a breathtaking and strategic position along the Sarawak River. At present, Fort Margherita has been converted into a Police Museum and many of its old cannons, cannon balls, guns, pistols, swords and other vestiges of its artillery can still be seen. About 30-40 minutes away from Kuching by car, Damai Beach is Kuching's nearest public beach. There is a small section of beach designated for public use with pleasant sand and little crabs that rush about and burrow underneath.